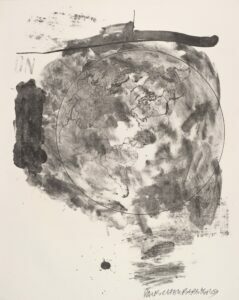 The Rauschenberg Research Project provides free worldwide access to a wealth of scholarly research and documentation relating to artworks by Robert Rauschenberg in SFMOMA’s permanent collection. 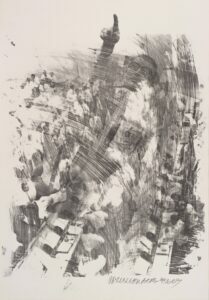 The museum’s holdings span the artist’s career from 1949 to 1998 and include Combines, sculptures, paintings, photographs, and prints and other works on paper. A rich range of materials surrounds the featured works, including newly commissioned essays, numerous images, interview footage, artist’s statements, conservation reports, and archival materials, which together provide new insights into the artist’s work. These resources may be accessed through the orientation points below. 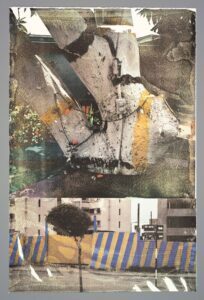 The Rauschenberg Research Project was produced by SFMOMA under the auspices of the Getty Foundation’s Online Scholarly Catalogue Initiative, with the support of the Robert Rauschenberg Foundation. 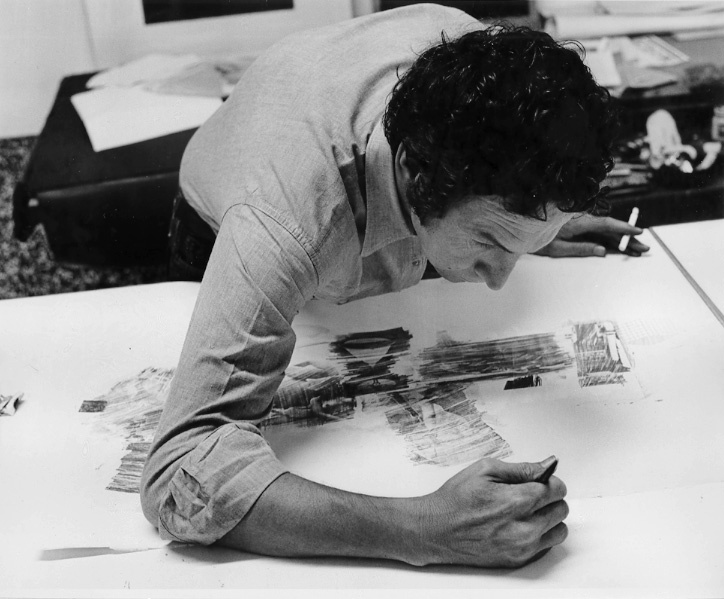 Leadership support for the Rauschenberg Research Project is provided by The Getty Foundation. 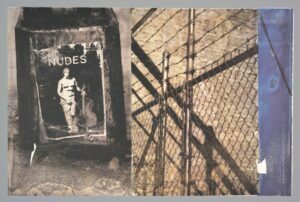 Generous support is provided by the Robert Rauschenberg Foundation. 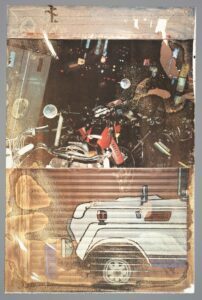 The Rauschenberg Research Project catalogs more than eighty-five artworks by Robert Rauschenberg from SFMOMA’s permanent collection. 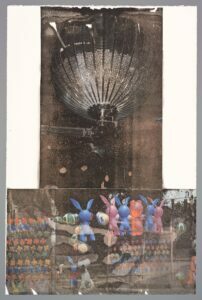 The featured works are indexed on the Rauschenberg Research Project home page, which acts as an orientation point for the materials assembled in this publication. The project originally launched in July 2013. The October 2015 relaunch of SFMOMA’s redesigned website precipitated the Rauschenberg Research Project relaunch in February 2016. The contents of the catalogue remain the same. Navigation has been simplified and legacy URLs from the previous design have been preserved and will be supported through all future iterations of the museum’s website to maintain the continuity and permanence of the project. 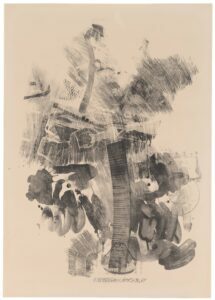 Artwork titles and dates reflect the most recent research undertaken by SFMOMA staff and the Robert Rauschenberg Foundation, and follow the Foundation’s accepted conventions as of July 2013. A full list of preferred titles is available in the More Links and Info section. 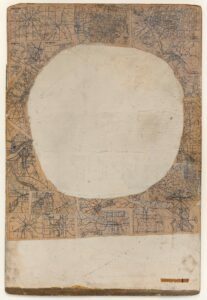 When you are navigating within the project, a “Rauschenberg Research Project” link will be visible at the top of each page. Clicking on that link will take you back to the project home page. Every artwork included in the project is documented with an Artwork Information page. Nineteen works have also been treated in scholarly essays commissioned for this publication, which may be found on the Essay pages. On each Artwork Information page you will find a brief text and expandable sections containing ownership, exhibition, and publication histories; marks and inscriptions; and research materials (views of the artwork, commentary and interviews, and museum files). Publication histories are organized chronologically. 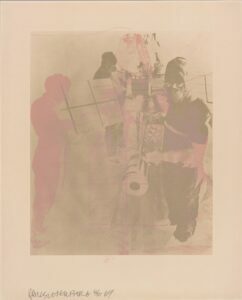 For prints, these listings document general discussions of the related series or portfolio, rather than specific references to the SFMOMA edition. Exhibition histories are also organized chronologically, with the exception of permanent collection rotations, which are noted by year at the end of the listing rather than integrated according to their full exhibition dates, because works are occasionally moved during these presentations. Except in the case of prints, whose exhibition histories have not been documented, all exhibition and publication details have been confirmed with primary documentation. The current exhibition and publication histories are complete as of August 31, 2016, and will be updated regularly. Notes at the bottom of these histories indicate when each one was last reviewed and whether or not it has been updated since the launch of the Rauschenberg Research Project in July 2013. Research Materials gathered for each artwork may include additional images, commentary, curatorial reference documents, and conservation notes and reports related to a given work, when available. 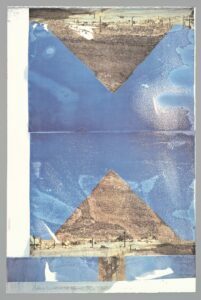 All materials in this section were prepared as part of the Rauschenberg Research Project. Video interviews prepared as part of this project are always presented on pages that include a “part of the Rauschenberg Research Project” link and are accompanied by searchable transcriptions that are also available as downloadable PDFs. 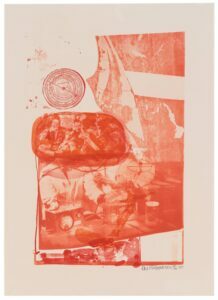 SFMOMA has one of the foremost collections of Robert Rauschenberg’s artwork, with holdings comprising more than eighty-five individual Combines, sculptures, paintings, photographs, prints, and other works on paper made over the course of the artist’s career. 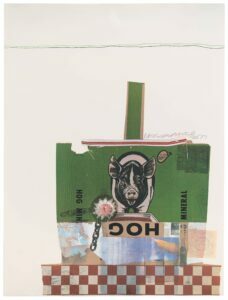 Dating from 1949 to 1998, these works represent Rauschenberg’s cross-disciplinary approach and the breadth of his appetite for experimentation. 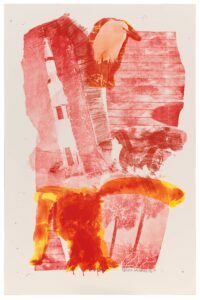 Fittingly, the museum has a rich history of exhibiting Rauschenberg’s work. 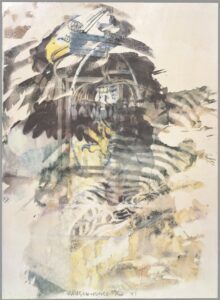 Since 1971 SFMOMA has organized or hosted seven solo shows and served as the only West Coast venue for the artist’s 1976 retrospective and the groundbreaking 1991 survey Robert Rauschenberg: The Early 1950s. 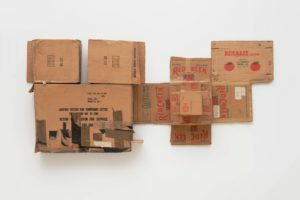 Collection (1954/1955) holds a special place in this history, having come to SFMOMA as a gift from Harry W. and Mary Margaret Anderson in 1972, at a time when the museum sought to raise the ambitions and broaden the scope of its collection. This critical early Combine painting has anchored the museum’s gallery presentations of mid-century American art and served as a center of gravity for the growth of the Rauschenberg holdings for more than forty years. 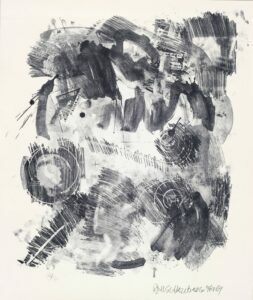 In 1998, SFMOMA acquired fourteen works directly from the artist. 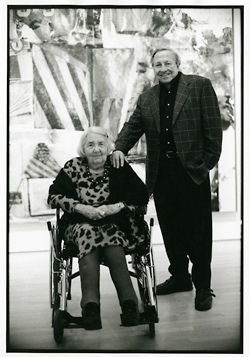 This landmark purchase was made possible through the extraordinary support of Phyllis Wattis, with additional support from two other SFMOMA trustees. 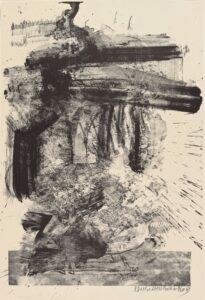 Among the works included in that acquisition were two icons of twentieth-century art—Erased de Kooning Drawing and Automobile Tire Print (both 1953)—as well as other breakthrough pieces from the early 1950s, such as White Painting [three panel] (1951), Untitled [glossy black painting] (ca. 1951), and Mother of God (ca. 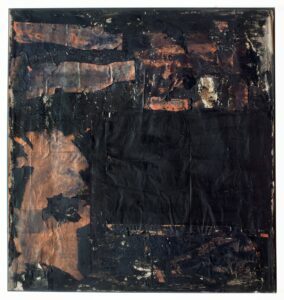 1951), one of the artist’s earliest surviving paintings. 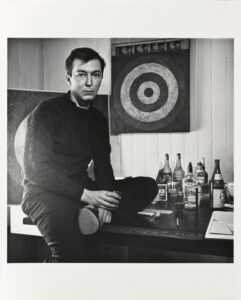 This concentration of important early works by Rauschenberg is unmatched anywhere in the world. 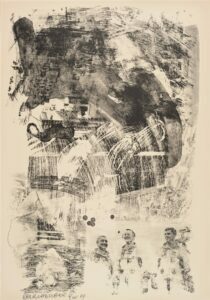 The Rauschenberg Research Project represents the culmination of SFMOMA’s efforts to study and provide access to these works, a commitment to the artist that we have sought to honor since the time of the 1998 acquisitions. The Essay pages include a citation tool that will generate the preferred citation for a selected passage of text. To activate the tool, highlight the area you would like to cite and click the “Create Citation” button that will appear along the right side of the page. When citing full essays or other pages within the Rauschenberg Research Project, please refer to the examples below. The publication date for most materials is 2013. Where applicable, exceptions are noted in the citations provided on the essay pages or in related downloadable materials. 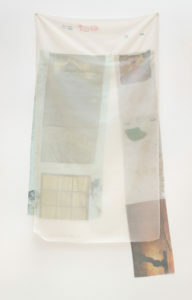 Sarah Roberts, “Collection,” Rauschenberg Research Project, July 2013. 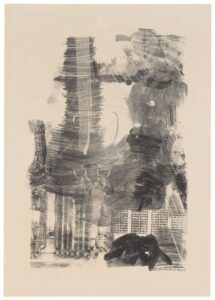 San Francisco Museum of Modern Art, https://www.sfmoma.org/artwork/72.26/essay/collection/. Paragraph 1. 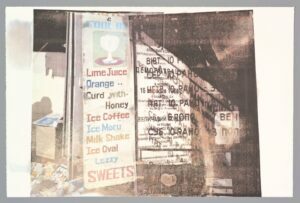 “Collection: Overview,” Rauschenberg Research Project, July 2013. San Francisco Museum of Modern Art, https://www.sfmoma.org/artwork/72.26. 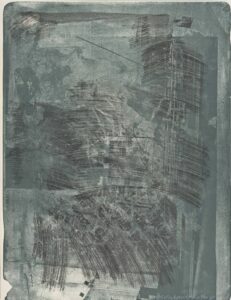 “Conservation reports relating to Robert Rauschenberg’s Collection, 1972-1991,” Rauschenberg Research Project, July 2013. 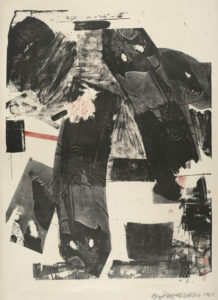 San Francisco Museum of Modern Art, https://www.sfmoma.org/artwork/72.26/research-materials/document/COLL_72.26_101/. The Getty Foundation conceived of the Online Scholarly Catalogue Initiative (OSCI) at a moment when museums perceived the vast opportunities of digital publishing and were searching for avenues to move forward. The Foundation’s extraordinary generosity provided much-needed momentum and instrumental support for the Rauschenberg Research Project. The OSCI project staff at SFMOMA extends sincere gratitude to current and former Foundation staff members Deborah Marrow, Joan Weinstein, Anne Helmreich, Kristin Kelly, Nancy Micklewright, Hilary Walter, and Christina Lopez, as well as to former program officer Tina Olsen, who planted the seeds of the initiative. SFMOMA’s team also benefited greatly from dialogue with our fellow OSCI institutions. We appreciate the Getty Foundation’s successful efforts to regularly convene all nine museums, and we thank our OSCI colleagues for the rich discourse that unfolded in all our meetings. I offer my deepest thanks to the staff and Board of the Robert Rauschenberg Foundation for their enthusiastic embrace of the project. I am greatly indebted to the Foundation’s Executive Director, Christy MacLear, and to Christopher Rauschenberg, President and Chairperson of the Board of Directors, for supporting online access to the artist’s work through our publication. I extend warm gratitude to David White, Susan Davidson, and Gina Guy for opening the Foundation’s essential archival resources, and for answering endless questions with patience and good cheer. Additional thanks to Rauschenberg Foundation and Rauschenberg studio staff members present and past who have been indispensable to our research: Julia Blaut, Thomas Buehler, Laurence Getford, Bradley Jeffries, Kayla Jenkins, Shanna Kudowitz, Matt Magee, Pedro Sanchez, Amanda Sroka, Lawrence Voytek, and Lawrence Wright. An extraordinary number of individuals and institutions have given their time and assistance to the Rauschenberg Research Project over the nearly five years that have passed from inception to publication. SFMOMA Director Neal Benezra, and Ruth Berson, Deputy Museum Director, Curatorial Affairs, were steadfastly committed to this project from the very start, ensuring its realization during a period of unprecedented growth and change within the institution. Elise S. Haas Senior Curator of Painting and Sculpture Gary Garrels provided curatorial leadership and unwavering support. Special thanks are owed to Director of Collections and Conservation Jill Sterrett for immediately grasping the wide-ranging impact and potential of the project and for being a mentor and advocate of the highest order. 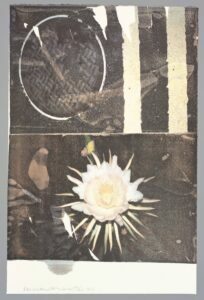 The project benefited from the generosity of many individuals who knew and worked with Robert Rauschenberg, and who contributed their memories and insights: Brigid Berlin, Carolyn Brown, Jasper Johns, Brice Marden, Knox Martin, David Myers, Robert Petersen, David Prentice, Yvonne Rainer, Dorothea Rockburne, Rachel Rosenthal, Calvin Tomkins, Charles Yoder, and Susan Weil. Especially warm thanks to Darryl Pottorf and Mark Pace for welcoming me to Captiva Island, Florida, and opening the artist’s home and studio. I also appreciate the contributions of Richard Cándida Smith and his team at the Regional Oral History Office, The Bancroft Library, University of California, Berkeley, for guiding me through our early interview with David White, and for imparting model interview practices. 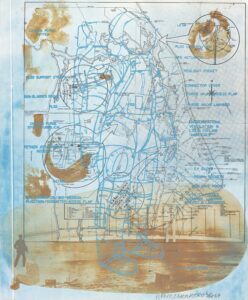 I offer sincere gratitude to the scholars who contributed essays to the catalogue; their insightful perspectives amplify our understanding of this rich body of work and of Rauschenberg’s contributions to the field of art. For their time and thoughtful writing, I thank Nicholas Cullinan, Susan Davidson, Roni Feinstein, Gary Garrels, Caitlin Haskell, Branden W. Joseph, Robert S. Mattison, Jeffrey Saletnik, and James Merle Thomas. The project has been enriched greatly by the scholarship of others, and I am grateful for the counsel of Amy Schichtel, Roger Anthony, and Jennifer Field, Willem de Kooning Foundation; Roberta Bernstein, Jasper Johns Catalogue Raisonné; Julie Barten, Solomon R. Guggenheim Museum; Carlos Basualdo, Philadelphia Museum of Art; Clifford A. Lynch, Coalition for Networked Information; Kirk Nickel, doctoral program, Department of the History of Art, University of Pennsylvania; and Jeffrey Saletnik, Indiana University. I also thank my curatorial colleagues at SFMOMA: Janet Bishop, Gary Garrels, Caitlin Haskell, Corey Keller, and Erin O’Toole read early drafts of my essays; and Peter Samis shared his wealth of insight on digital publishing early in the project. For aiding the catalogue team’s research, I thank Marisa Bourgoin, Archives of American Art, Smithsonian Institution; Michelle Harvey, Museum of Modern Art Archives, New York; Geri Aramanda, Menil Archives, The Menil Collection; Francine Snyder, Library and Archives, Solomon R. Guggenheim Museum; Ann Brandwein, Wadsworth Atheneum; Leslie Calmes, Center for Creative Photography, University of Arizona; Diane Mullin, Weisman Art Museum, University of Minnesota; Anne Halpern, National Gallery of Art, Washington, D.C.; Valerie Fletcher and Melissa Ho, Hirshhorn Museum and Sculpture Garden, Smithsonian Institution; David Vaughan, Merce Cunningham Foundation; Shelley Lee, Roy Lichtenstein Foundation; D. J. Hoek, Northwestern University Music Library; Daniel Fink, Newberry Library; Jessica McIntyre, Minneapolis Institute of Arts; Susan Snyder and Lori Hines, The Bancroft Library, University of California, Berkeley; and the staff of the Getty Research Institute Library. For facilitating access to works for study, warm thanks go to Doris Fisher; Mimi Haas; Helen and Charles Schwab; Laura Satersmoen, Gap, Inc.; Mary Zlot and Maria Sullivan at Zlot Buell + Associates; Ed Schad at The Broad Art Foundation; Billie Milam Weisman and Mary-Ellen Powell of the Frederick R. Weisman Art Foundation; and Dana Miller, Whitney Museum of American Art. The design of the catalogue benefited tremendously from advance research conducted by Renee Anderson, user-experience consultant (formerly at Hot Studio), and her interviewees, who looked at prototypes and discussed their research practices with us: Thomas Crow, New York University; Branden W. Joseph, Columbia University; Jeffrey Saletnik; independent scholars Roni Feinstein and Kathleen Campagnolo; curators Gary Garrels, Erin O’Toole, and Tanya Zimbardo and conservator Michelle Barger at SFMOMA; Nicholas Cullinan, Metropolitan Museum of Art, New York; and Joshua Shirkey and Will Smith, both doctoral students at New York University when interviewed. We are grateful to Gavin Jones, Peter Blank, Anna Fishaut, Katie Keller, David Platt, Amber Ruiz, Huey-Ning Tan, and Glen Worthey at Stanford University, whose conversations with Renee about digital research and digital humanities informed thinking on the project. Thanks are due to Hot Studio for undertaking the website design and to Carbon Five for technical implementation. 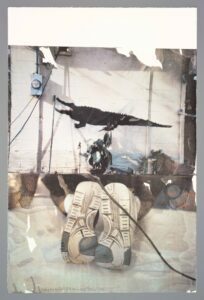 Ben Blackwell, Ian Reeves, and Robin D. Myers contributed beautiful artwork photography and digital processing. Tony Manzella and his team at Echelon Color worked digital magic to breathe life into some unusually challenging color images. Thanks to Henrik Kam, K. C. Smith, and Jim Granato for capturing video of artworks in motion and museum work in progress. Richard Robertson, video editor, transformed footage into stories. Lars Nordström provided a thoughtful and thorough Swedish to English translation. Denise Rohlfs transcribed hours of interview footage with grace, efficiency, and speed. 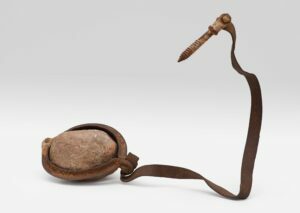 This project touched nearly every department in the museum, often requiring people to step out of their accustomed roles and routines to tackle thorny problems. I thank all my colleagues who have jumped in with a willingness to try something new. Chad Coerver was a much-appreciated partner and interlocutor; his valuable perspectives on the implications of the project for all areas of the website and the museum’s long-term vision for digital publishing greatly enriched the end result. I am deeply thankful to Leo Ballate, Andrew Delaney, Dana Mitroff Silvers, and Layna White—the core contributors to the project’s technological requirements—whose sharp intellects and world-class senses of humor sustained the team through many long meetings and produced elegant solutions to convoluted problems of information architecture. 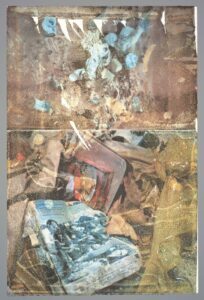 I extend special thanks to Paula De Cristofaro and Amanda Hunter Johnson, my colleagues in the Elise S. Haas Conservation Studio, for sharing their insights on the material construction of Rauschenberg’s work over the past four years and contributing treatment notes and reports. Thanks also go to Michelle Barger and James Gouldthorpe for their support throughout the project. I could not be more grateful for the assistance of Barbara Rominski and the staff of the SFMOMA Library and Archives for sourcing books and articles and calling in favors worldwide to gain access to rare publications. Brandon Larson, Jess Kreglow, and the members of the installation team squeezed photography and examination sessions into their very busy exhibition schedule. Tina Garfinkel and her team of registrars made access to works possible, despite similarly difficult scheduling demands. Layna White’s team in Collections Information and Access faced the project’s challenges with aplomb. Susan Backman coordinated photography scheduling, and Don Ross created beautiful new images and video of many artworks; Marla Misunas and Margaret Kendrick attended to the intricacies of our collections information system; and Sriba Kwadjovie made valuable contributions to conversations about image licensing. John Morris helped us navigate the landscape of digital asset management and skillfully and graciously handled many last-minute image adjustments. Interns Natalie McCann, Dana Ospina, and Emily Rhoads performed research, checked references, and took on Photoshop tasks, providing essential support at different phases of the project. In the Marketing and Communications office, Katie Tamony and her team thoughtfully brought the project to the attention of the public. Particular thanks are due to Christine Choi, Jennifer Knox White, Willa Koerner, and Lisa Macabasco. Under the leadership of Jonathan Peterson in the Development department, Andrea Morgan and Misty Youmans provided guidance informed by experience, and I’m grateful for their ongoing efforts on the museum’s behalf. In Content Strategy and Digital Engagement, Morgan Levey stepped in at a critical moment to manage video editing and produced wonderful results. Jennifer Sonderby, Sophine Lim, and James Provenza offered design guidance on vital visual components of the catalogue. Judy Bloch offered ongoing editorial support and went above and beyond in the project’s final weeks to play a key role in the proofreading process. Thanks are also due to Juliet Clark and Victoria Gannon for their proofreading assistance. For her formidable diligence, the project team extends wholehearted thanks to copy editor Jennifer Boynton, whose meticulous fact-checking and proofreading brought precision to every facet of the text. My most profound thanks go Bridget Carberry, Amanda Glesmann, and Meredith Van Dyke, whose superhuman efforts not only got the catalogue completed on schedule but also raised the finished product above all hopes and expectations. Bridget saw the project through the final stages of CMS development and content loading, working with such efficiency and intelligence that she made it look easy. Meredith has been the bedrock of the research efforts, and her attention to detail, capacity for managing monumental amounts of information, and gracious spirit make her a pleasure to work with. Amanda’s phenomenal ability to simultaneously see the big picture and manage thousands of tiny moving parts is unsurpassed, as is her capacity to take on colossal amounts of work and laugh in the face of any crisis. Without the commitment of these three, this catalogue simply could not have been brought to fruition. Finally, I give heartfelt thanks to my family—Keith, Jackson, Ellie, and Merry Roberts, and Susan Rehm—whose warmth and humor provided much-appreciated balance, support, and perspective. This page provides supporting documents and complementary resources from both inside and outside SFMOMA. 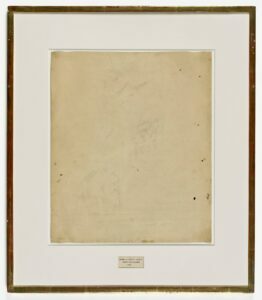 The “From SFMOMA” section links to the full versions of documents cited or excerpted in various areas of the project website and a publication that discusses SFMOMA’s Rauschenberg holdings more generally. The “Around the Internet” section links to external sites that offer useful information or further reading about Rauschenberg and his circle. 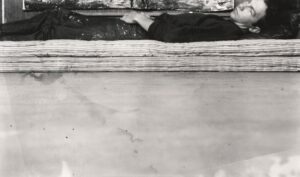 Oral history interview with Robert Rauschenberg, December 21, 1965. Archives of American Art, Smithsonian Institution, Washington, D.C.